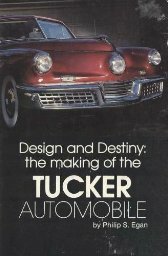 The story of the Tucker automobile has become an American legend. Over a half century separates our current time from 1948, and yet that sense of American optimism and hope of those post war years still permeates the Tucker story every time it is told. Phil Egan gives us his insider's description of how the automobile was designed, from illustrations on paper, to wood mock-up to clay models, from beginning to end. He tells how Preston Tucker had to change his dream as he faced the hard realities of production, and how his dream was finally crushed by politics. Also offered is a brief, photo-filled history of automotive designs of the 1930s, often thought of as the Golden Age of Automobile Design. This book is currently out of print and the AACA Museum has a limited number of copies available for sale.